Improved on the ale front - had two Portobello brews and two redemption brews as well as the GK dross. The Redemption brews were not bad though it's still somewhere to drop in for a swift pint before a train rather than a destination pub. Have been coming in here on and off for years mainly to watch sport; has always probably as right next to Euston station been pretty busy down the years for Liverpool games (my team). It has tidied itself up somewhat down the years. Less scruffy and probably less rowdy/loud as well. The beer quality has also improved quite a lot down the years. Always been happy with the service in here as well. That said I am surprised it is in the GBG as well. Beer quality is reasonable, and range OK in my view; neither are amazing though. I also can't go above 6/10 as the prices are I agree taking the piss now for the sort of pub this is. Doric Arch and Bree Louise are certainly better pubs in the area; for the sport/football to me it's a 50/50 between here and the Euston Flyer (which is no cheaper really beer price wise than here) in the area. Lovely Veggie fish and chips here. Good pub, nice ales but at times terrible staff and a real lack of sitting space. Too busy most evenings. 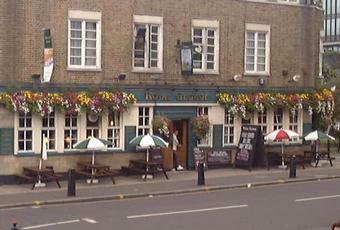 Maybe the best pub in Euston, it does however often get too packed in the evenings to be worth it. The fish and chips is good though.